Artist Adam McEwen recently created two sculptures for his exhibit “Switch and Bait” in New York, both sculptures were made from “machined graphite.” Graphite, like its allotrope diamond, is a form of carbon. 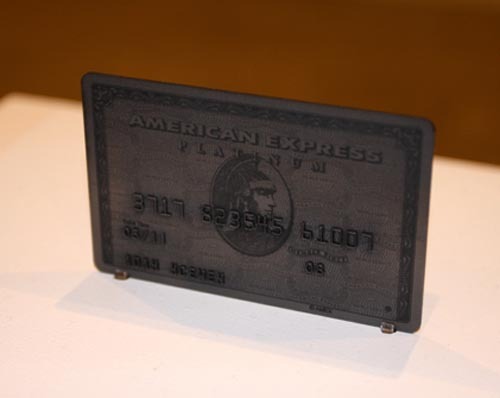 One of his two exhibits is an American Express Platinum Card created from Graphite. Art is in the eye of the beholder, but to us it seems that he is implying that the Visa Black Card is pulling a “Switch and Bait” and ripping off American Express Platinum Card (which the Visa Black Card more accurately compares to).